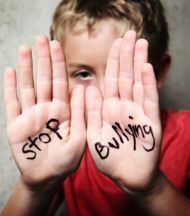 Bullying is a problem that has touched the lives of millions, stretching to all parts of the world. No matter your age, race, gender, nationality ─ you name it ─ the potential to be bullied exists, and it is extremely prevalent in the new age of technology. Teenagers everywhere are tormented by fellow peers, teammates, and even friends. Bullying exists in many forms, all serious in their own way. In order to stop this prominent problem, we must raise awareness and get everyone involved. As beneficial as technology is for communication and research purposes, it provides people with an outlet to anonymously condescend and harm others. Someone can hide behind the screen of their computer, endlessly plugging away about how ugly that one girl at school is. On the other side of the screen, that one girl is sitting at home, crying because the whole school read those mean comments. Little does the school know that this girl struggles with self-image and confidence issues, and these comments are a blow to her whole system. What seems like fun and games to some people is a nightmare to others. According to the US National Library of Medicine and National Institutes of Health, a survey of 15,686 sixth to tenth graders reported that 29.9% of them had either been bullied or bullied someone else. If you then equate this percentage to the entire population of school-aged children, the results grow dramatically. While it may seem like a small percentage, when you put it in perspective, these numbers are drastic and unacceptable. Something must be done. When I was in seventh grade, my fellow teammates suddenly started teasing me and treating me as inferior. It started on the soccer field, as they criticized my playing abilities and took any opportunity to point out my flaws. If I made a bad touch on the ball, instead of a constructive, “It’s okay! You’ll get it next time,” that you would expect out of seventh graders, I received eye rolls and loud screams of, “C’mon Abbey! What was that?” At first I thought that they were taking soccer more seriously and competitively, so I brushed it off. Then the comments started to be directed towards my personality and everyday life. I always seemed to be the subject of a joke about my innocent and “goody-two-shoes” qualities. They knew that I was bothered by curse words and uncomfortable topics of the sort, so in the locker room before a school practice, one girl shoved me against the wall, shouting a slew of curse words in my face. They also found it inexplicably hilarious to ask me what certain things meant, such as curse words or innuendos, because they knew it bothered me. That was the end of it. Her faced was stunned because she never expected this little innocent girl who let everyone walk all over her to say this to her, but I did, and it’s the best thing I ever did. They no longer teased me to my face. I’m sure they gossiped about me behind my back, but there was nothing I could do about it. The tormenting was finally over, but I still have the pain inside. I endured months of constant suffering because of these girls, and it was a feeling I hope that no one ever has to feel, but unfortunately, people feel it everyday. And people feel it on much larger scales than I did. Compared to stories you hear on the news and in prevention programs, my story is very minor, almost nothing. But to me, it was everything. I am not trying to compare my case to anyone who faces domestic violence, because I can only imagine what those women and children go through. My goal in sharing my story is to hopefully help people who feel like I did to feel brave enough to share their own story with someone – a friend, mentor, or family member – so that their stories do not escalate into worse situations. So what does bullying have to do with domestic violence and the work of A Woman’s Place (AWP)? “Bullying” can be used as an umbrella term with many branches, one including domestic violence. Bullying cannot be described with one simple definition, and neither can domestic violence because they each vary in every case. The story of my bullying is a lot different than the stories that make the news. And every woman’s story as to why she needs help is unique and different from everyone else’s. I volunteer at AWP’s shelter, and while most women do not tell their stories, the pain they are feeling is evident. They hurt for themselves and for their children, and this is something that shouldn’t be happening. No one should experience the pain that they feel, and we are the generation that needs to stop this. October is National Bullying Prevention Month, and it is a great time to start the change.